With “The Great Beauty ” we finally see on the big screen a charming and mysterious Rome, one of the most beautiful cities in the world. Not everybody knows that to all the famous locations that we see in the movie there are also many others that only real romans know. Here are some itineraries that reveal the mysteries of the Great Beauty of Rome. 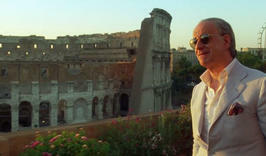 The scene is filmed in the Loggia , where Jep Gambardella goes to interview the artist Ron Sweet and attend his photo exhibition. Perhaps not everyone knows that this is one of the few fake scenes, the walls of the lodge have never hosted this exhibition. The ” palazzi delle principesse ” that Stefano opens to Jep and Ramona in their nightly walk are actually museums that host artworks from some of the most famous artists of all time. 2 . Villa Medici - Inside of which is the sculptural group of Niobe . The cannon that shoots right at the beginning of the film is below the terrace wherethe equestrian statue of Garibaldi stands, surrounded by busts of the heroes of the Roman Republic . 2 . A few steps away , the Fountain of the Acqua Paola, which overcomes the complex of San Pietro in Montorio, with the Temple of Bramante . Here is the door of the Priory of St. Mary on the Aventine , with the most famous keyhole in Rome , through which you can see the dome of St. Peter. In the end it’s all a trick. And here is the trick that makes disappear a girrafe in the heart of an archaeological site. Sorrentino establishes here the home of the protagonist Jep Gambardella, in the attic of a building in Piazza del Colosseo nr . 9, which overlooks the south side of on of the most famous monuments in the world. We find Jep walking along the walls of Ponte Sisto returning from the nightlife. 3 . Viola, the rich and depressed friend , lives alone with her psychopath son at Palazzo Sacchetti, in Via Giulia. 4 . Not far away you’ll find Palazzo Taverna were the fake nobles have setted their family museum. 5 . Orietta , the beautiful woman with whom Jep spends a night of love , lives in a apartment in Piazza Navona , right under one of the towers of the Church of St. Agnes in Agony , at Palazzo Pamphili. 6 . Visited another palace in the middle of the night inside the Palazzo Barberini, which is Raphael’s Fornarina . 7 . Jep walks to Via Veneto deserted , retaining only a vague memory of the Dolce Vita . Inside of which is the scene where a large group of women are waiting to undergo the injections of beauty.